Warren County Career Center Adult Technical Center is offering short-term courses in Drone Technology. This fast-growing field has many career paths you can follow. Start earning certification today, and find your future career in aviation! Call us for more information and to register: 513-932-8145! Passing this exam is a current FAA requirement to earn the small Unmanned Aircraft Systems Airman Certification. The objective of this course is to educate and prepare the remote pilot for the Federal Aviation Administration (FAA) Part 107 Remote Pilot Knowledge Examination. This class will go over regulations/requirements, National Airspace, weather/sources, loading/performance and sUAS operations. Students will be provided practice examinations to ensure they are prepared. This class is an exam preparation class only and does not include the scheduling and fees for the FAA 107 examination. However, WCCC can assist you in scheduling your FAA exam. Call, or come to the Warren County Career Center Adult Education Office, to register. Payment is due at the time of registration. The objective of this course is for students to gain strength or strengthen their sUAS (drone) flight and navigational skills. Students will utilize flight simulation trainers to introduce and challenge themselves to accurately and safely navigate across varied domains and environments. This course is for students who wish to advance their flight navigational skills during simulated scenarios that enhance safe and compliant sUAS (drones) activities in real world situations. At the completion of the simulation training, students will have the opportunity to fly the programs sUAS (drone) in a controlled and regulated environment. 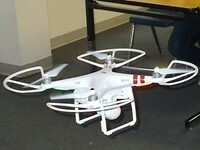 Students will gain or increase knowledge and skill-sets in sUAS (drone) components, flight controls, power supplies, electrical schematics and basic repair techniques for the s(UAS) drone. Workshop subject areas include basic electronics, soldering, sUSA assembly/disassembly and troubleshooting. The instructor will provide hands-on training for basic repairs and troubleshooting using the schools sUAS (drone) resources.